On the forty-fifth floor of the basement, the 103,683rd asexual ant made her way into the wrestling halls, low-ceilinged rooms where the soldiers exercised in readiness for the spring wars. All around, warriors were fighting duels. The opponents first felt each other over to assess build and leg size, then circled, tested each other's flanks, pulled each other's hairs, threw each other scent challenges and provoked each other with the club ends of their antennae. Finally, they flung themselves together with a clash of their shells. Each of them tried to grab hold of the other's thoracic joints. As soon as one of them managed it, the other tried to bite her knees. Their movements were jerky. They reared up on their hind legs, collapsed in a heap and rolled about furiously. They usually held their grip, then suddenly struck another limb. They were careful, though. It was only a training exercise. Nothing got broken, no blood was spilled. The fight ended as soon as an ant was turned over and laid back its antennae in submission. The duels were quite realistic all the same. The combatants often stuck their claws in each other's eyes to get a grip and snapped their jaws on empty air. Some way off, gunners seated on their abdomens were aiming and firing at bits of gravel five hundred heads away. The jets of acid often hit their targets. An old warrior was teaching a novice that the outcome of the battle was decided before contact was made. The mandible or jet of acid only ratified a situation of dominance already recognized by the two opponents. Before the fray, there was inevitably one who had decided to win and one who consented to be beaten. It was simply a question of assigning the roles. Once they had been allocated, the winner could shoot a jet of acid and hit the bull's-eye without aiming while the loser could go all out with her mandibles without even succeeding in injuring her opponent. Only one piece of advice was worth giving: accept victory. It was all in the mind. Accept victory and nothing could withstand you. Two duelists jostled the 103,683rd soldier. She shoved them away vigorously and went on her way. She was looking for the mercenaries' quarters, which had been set up below the arena where the fights took place. Soon she caught sight of the passage leading to it. Their hall was even more vast than that of the legionaries. Admittedly, the mercenaries spent all their time in their exercise area. Their only reason for being there was war. All the peoples of the region, both subject and allied, rubbed shoulders there: yellow ants, red ants, black ants, glue-spitting ants, primitive ants with poisonous stings and even dwarves. Yet again, it was the termites who had thought up the idea of feeding foreign populations so that they would fight beside them during invasions. The subtleties of diplomacy had led the ant cities to enter into alliances with termites against other ants. This had led the termites to an arresting thought: why not hire ant legions outright to live permanently in the termite hills? It was a revolutionary idea, and the ant armies had been quite surprised when they had to confront sisters of the same species fighting for the termites. The Myrmician civilization, so quick to adapt, had overplayed its hand this time. The ants would gladly have responded by imitating their enemies and taking termite legions into their pay to fight the termites. But there was one major obstacle to their plan: the termites were absolute royalists. Their loyalty was flawless and they were incapable of fighting their own kind. Only ants, whose political regimes were as varied as their physiology, were capable of coming to terms with all the perverse implications of fighting as mercenaries. Not that it really mattered. The great russet ant federations had been content to reinforce their armies with a large number of legions of foreign ants, all united under the one Belokanian scent banner. The 103,683rd soldier approached the dwarf mercenaries and asked them if they had heard of the development of a secret weapon at Shigae-pou, a weapon capable of annihilating an entire expedition of twenty-eight russet ants in a flash. They replied that they had never seen or heard of anything so effective. She questioned other mercenaries. A yellow ant claimed to have witnessed such a wonder. It was not a dwarf attack, however, only a rotten pear that had unexpectedly fallen from a tree. Everyone let out bubbly little pheromones of laughter. It was yellow ant humor. The 103,683rd asexual ant went back up to a room in which some of her close colleagues were training. She knew them all individually. They listened to her carefully and believed her, and there were soon over thirty determined warriors in the group searching for the dwarves' secret weapon. If only the 327th male could have seen it! Be careful. An organized band is trying to get rid of anyone who wants to know. They must be russet ant mercenaries working for the dwarves. You can identify them by their smell of rock. For the sake of security, they decided to hold their first meeting in the very depths of the city in one of the rooms on the fiftieth floor. No one ever went down there. They should be able to organize their offensive without being disturbed. But 103,683rd's body indicated a sudden acceleration in time. It was 23°C. She took her leave and hurried off to her meeting with 327th and 56th. 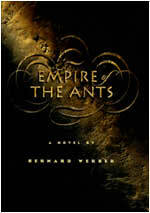 Excerpted from Empire of the Ants by Bernard Werber. Copyright © 1991 by Editions Albin Michel S.A. Translation copyright © 1996 by Margaret Rocques. Excerpted by permission of Bantam Press, a division of Transworld Publishers Ltd. All rights reserved. No part of this excerpt may be reproduced or reprinted without permission in writing from the publisher. Bantam Books hardcover edition published February 1998.